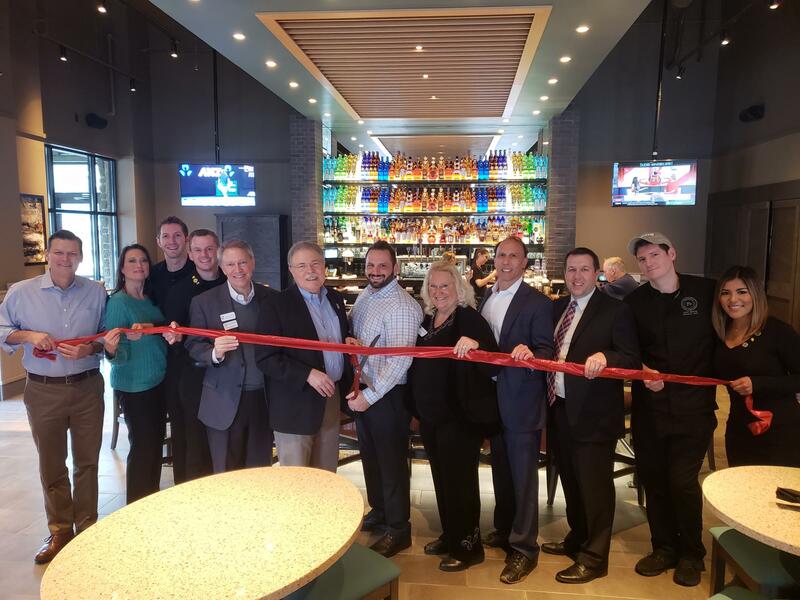 PEACHTREE CORNERS, GA. (January 24, 2019) – Firebirds Wood Fired Grill, a classic American restaurant offering exceptional wood-grilled dishes with bold flavors and fresh ingredients, will open Monday, Jan. 14, in Peachtree Corners at 5215 Town Center Boulevard across The Forum on Peachtree Parkway. Firebirds is known for specializing in hand-cut aged steaks, fresh seafood, chicken and ribs. Firebirds’ first metro Atlanta location is in Alpharetta. The Firebirds menu provides a wide variety of selections, including its signature Aged Ribeye, Filet Mignon, Wood Grilled Salmon, Durango Burger, Grilled Shrimp & Strawberry Salad, Lobster Spinach Queso and Creme Brulée Cheesecake. The Kids Menu offers healthy options certified by the National Restaurant Association’s Kids LiveWell program, and gluten-sensitive menu items, such as Grilled Tenderloin Salad, Beef Filet Kabob, Wood Grilled Salmon and Parmesan Mashed Potatoes, are also available. The award-winning FIREBAR® boasts an extensive selection of wines, including two private Firebirds labels, craft beers and specialty cocktails, such as the Double Black Diamond Martini® infused with fresh pineapple. The FIREBAR® also serves seasonal cocktails, such as the Hemingway Daiquiri, Ginger Basil Mango Mojito, Siesta Sangria and more. Firebirds offers unique and refreshing non-alcoholic drinks as well, such as the Strawberry Basil Cooler and Grapefruit Ginger Craft Soda. Firebirds’ new Peachtree Corners location will feature the restaurant’s new, energetic design concept in a warm, inviting atmosphere for which Firebirds is known. The modern design and décor include light-colored woods, charred black brick, floor-toceiling windows, exposed steel, contemporary light fixtures, abstract artworks and pops of teal to complement Firebirds’ signature red and orange. The open concept gives guests views of the exhibition kitchen, wood-fired grill, award-winning FIREBAR® and lounge. Additionally, guests can enjoy their meals and drinks on a comfortable, enclosable patio perfect for any season. The Peachtree Corners Firebirds will be open Sunday – Thursday 11 a.m. - 10 p.m. and Friday – Saturday 11 a.m. - 11 p.m. Monday through Friday 4 - 7 p.m. features specially priced bar bites at the FIREBAR® and patio. Guests can also enjoy half-priced glasses and select bottles of wine all day Monday each week on Wine Down Mondays or all day drink specials varying from wine and craft beer to our Double Black Diamond Martini® on Thursdays throughout the entire restaurant. As part of the company’s ongoing efforts to give back to the community, Firebirds donates $1.25 per glass of house-made lemonade ordered in the restaurant to Alex’s Lemonade Stand Foundation (ALSF) year-round to help fund childhood cancer research. Additionally, each June, the restaurant participates in the ALSF’s fundraiser, Lemonade Days, in which it donates to the cause all proceeds from the sale of house-made lemonade at a stand by the front door. Nationwide, Firebirds has already raised more than $1.2 million for ALSF, one cup of lemonade at a time. Looking for talented team members, Firebirds is hiring for all positions. Job seekers can apply at https://firebirdsinternational.com/careers. Firebirds Wood Fired Grill, a contemporary-polished restaurant, is an energetic twist on the traditional grill featuring a boldly flavored, classic American menu in an inviting, firecentric atmosphere. Signature menu items include hand-cut, aged steaks and fresh seafood hand-fileted in-house and seared over locally sourced hickory, oak or pecan wood in Firebirds’ scratch kitchen and exposed wood-fired grill. The open, stylish, enticing décor incorporates wood-fired themes and entertaining spaces, such as the outdoor patio with seasonal comforts and the award-winning FIREBAR®. Popular specialties include Wine Down Mondays, happy hour, artisan cocktails, craft beer, bourbon, after dinner drinks and Firebirds’ private label wine. In keeping with its mission, “To Serve, Enrich and Exceed,” Firebirds supports ever-growing sustainability efforts throughout its restaurants and partners with Alex’s Lemonade Stand Foundation, with more than $1.2 million raised for childhood cancer research through the sale of fresh-squeezed lemonade. Visit firebirdsrestaurants.com to become a member of Firebirds’ Inner Circle, make an OpenTable reservation or order ToGo online.